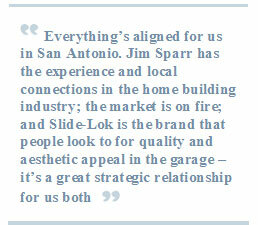 Phoenix, AZ -- Oct. 10, 2006 -- With over 20 years of success in the remodeling and contracting industries in the Odessa and Midland, TX markets, well known entrepreneur Jim Sparr makes his most aggressive move yet--partnering with market leader Slide-Lok to establish Slide-Lok of San Antonio. The San Antonio based company becomes the latest in a string of US and Canadian garage storage Master Dealerships bearing the Slide-Lok name and featuring the market leader’s products. www.slide-lokofsanantonio.com, or contact Slide-Lok at 800-835-1759 or www.slide-lokofthebayarea.com.